St. Petersburg, 1911, Aktie über 50 Rubel, #3331, 32,5 x 24,2 cm, orange, schwarz, dreisprachig: Russisch, Französisch, Chinesisch oder Mongolisch, Wellenschnitt rechts, Randeinriss hinterklebt, Goryanov 3.40.1. 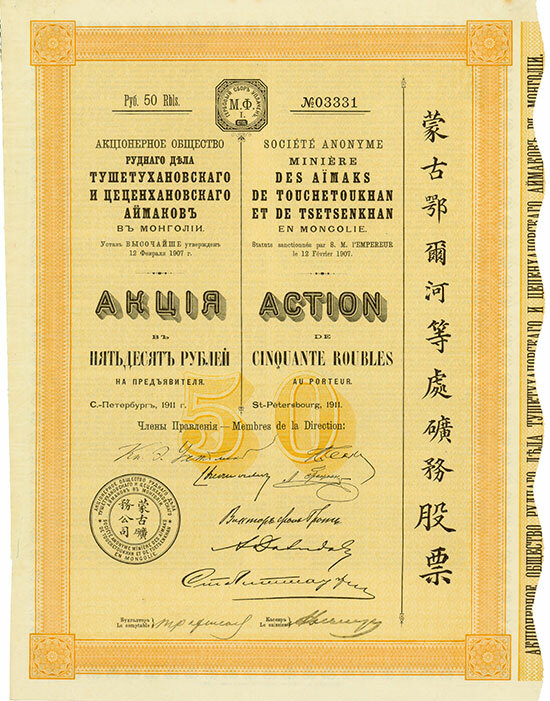 St. Petersburg, 1911, Share of 50 Rouble, #3331, 32.5 x 24.2 cm, orange, black, text in three languages: Russian, French, Chinese or Mongolian, scalloped edge at right edge, tear repaired with tape, Goryanov 3.40.1. The company was incorporated in 1907. The area of Mongolia, which was almost not visited by Western people, was first explored by the Russian Potanin beginning in 1876. This was the beginning of a powerful, also economically influence of Russian in that region. The Western Mongolian Aimak are according to a historical tradition issue of an army, which was send to the Western by Manghu-Khan, the grandson of Dschingis-Khan. This tribe is located in the western part of the Afghan capital city Kabul. АО было основано в 1907 г. В 1876 г. Потанин начал изучать неизвестные до тех пор европейцам регионы Монголии. Позже Россия оказывала значительное влияние на экономическое развитие этих территорий. Западно-Монгольские аймаки, согласно преданию, были потомками армии, которым Мангу-Хан (внук Чингиз-Хана), приказал отправиться на запад, где они ведут кочевой образ жизни и по сей день, напр., в районе г. Кабула – столицы Афганистана.